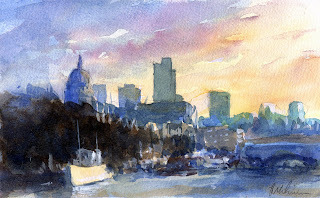 RoyTheArtist and Friends: London View, Evening. I think this may be one of the best skies I have painted so far, sometimes it just flows! There is a kind of magic when watercolour simulates light effects in a landscape. The hard part.... knowing when to stop! This one is on ebay right now, see what a bargain you can have! It IS one of the best skies, if not THE BEST you have painted so far. It is lovely Roy. I love stormy skies, and although I am a beginner, I tend to aim for skies like this, too, when I water paint! Love your videos - thanks for sharing the art of water painting!